When it's time for you to sell, a professional real estate photographer can help make sure that your listing really stands out from the crowd. You don’t think twice about commissioning professional photos of your children, right? Even if you don’t have any immediate plans to move, it’s wise and cost-effective to hire a real estate photographer. The reason is that in today’s real estate market, when so many house hunters are browsing image-laden listings online, better-quality photos attract more interest, helping you to sell your house more quickly and for a higher price than you might have gotten otherwise. For advice, we reached out to Brian Balduf, CEO and founder of VHT Inc., a national firm that links homeowners with professionals who are skilled in the art of creating glamour shots of home exteriors and interiors. (If you’re curious about the economics here, know that VHT charges $100 to $500 for a portfolio.) There are many good reasons for commissioning professional real estate photography. Five especially opportune situations are listed below, along with one type of photo that, according to Balduf, should never be taken. Completed renovations. Before the paint chips and the carpet frays in the home addition you’ve completed or in the kitchen you’ve remodeled, look into real estate photography as a way of capturing that project in its best possible light. Remember to snap your own “before” photos to highlight the improvements. Details and polish. Buyers want to see points of distinction up close. “What makes your house different from the one next door?” asks Balduf. “If you think it’s the fireplace, get high-quality shots of what makes it special.” In other words, identify your home’s selling points, then make sure the real estate photography emphasizes them. Capture the best light. Even the best apps on the fanciest smartphone cannot match a photographer’s skill and expertise in correcting for deep shadows, fluorescent lighting, and miscellaneous other factors that typically compromise the work of an amateur. If there is a showcase room in your house that looks best at a certain time of day—late afternoon, for example—then schedule your appointment with the photographer during those hours. Front and façade. Studies indicate that house hunters online pay the most attention to façade photos. The real estate photographer is very likely to understand that for a stunning shot of the exterior, it’s best not to capture a panorama of the nondescript driveway and unadorned garage door. “Obtuse angles often work best,” says Balduf. Professional ambitions. If you’re considering a career (or a sideline gig) in real estate sales, home design, or property development, then you may be able to advance your career goals even as you source beautiful photos of your own home. Not only should you be sure to include these images in your professional portfolio, but you should also expand your network of contacts by hiring a different real estate photographer each time you complete a new renovation. 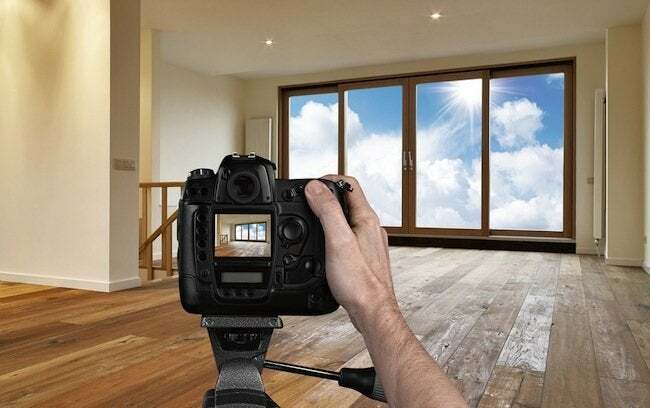 Finally, Balduf warns that there is one set of photographs a seller ought never to include in a real estate listing: unfinished remodeling projects. “You see what it could be,” he says, but house hunters see only what it isn’t.